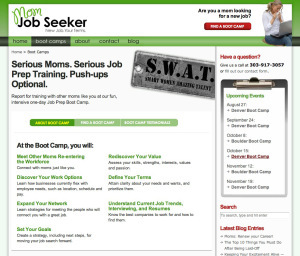 Mom Job Seeker prepares mothers re-entering the workplace after their kids have grown up a bit. April Stensgard, owner, contacted Katz Web Design with the goal of having a business blog that would facilitate online event registration. Author Zack KatzPosted on August 7, 2008 Categories Web Design Portfolio, WordPressTags Event, Event Registration, Events, Management, Plugin, registration, WP PluginsLeave a comment on MomJobSeeker.com launched!